Who needs the Kwik-E-Mart? How can you score free Donuts? 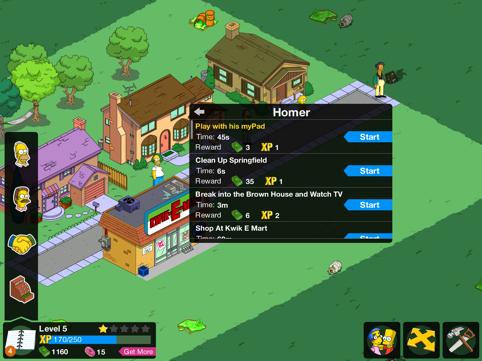 Find out with this guide to Springfield. 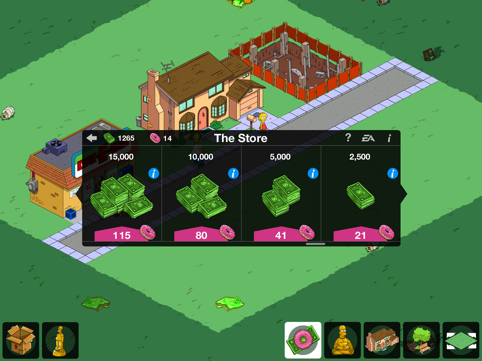 For a while, we thought EA Mobile's The Simpsons: Tapped Out was history, following an unimpressive launch earlier this year. Thankfully, the publisher made necessary tweaks, and the game is back on iPhone and iPad, giving iOS users the world over a chance to create their personal Springfields. 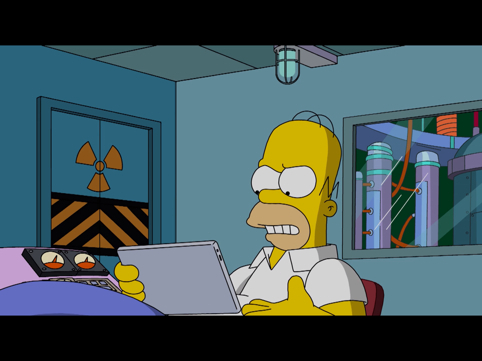 With this in mind, we created this The Simpsons: Tapped Out cheats and tips guide for beginners to get them started. As you'll soon learn, Donuts are a player's best friend. These tasty-looking treats prove useful for speeding up tasks and purchasing various items and even characters. They're also tough to earn from simply playing the game. 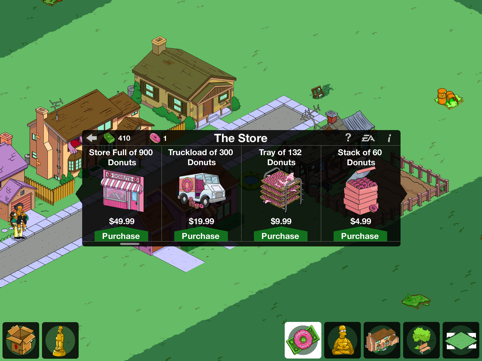 That said, feel free to visit the virtual shop and buy more Donuts. In addition, you can exchange donuts for Money. It's definitely in your best interest to build homes and businesses, as these structures not only earn money all day, even when you're not around, but also prove useful for sending characters on missions. For instance, you cannot tell Lisa Simpson to shop at Apu's Kwik-E-Mart if you don't have the convenience store in your town, but come on. What's Springfield without the Kwik-E-Mart? Shelbyville, that's what. 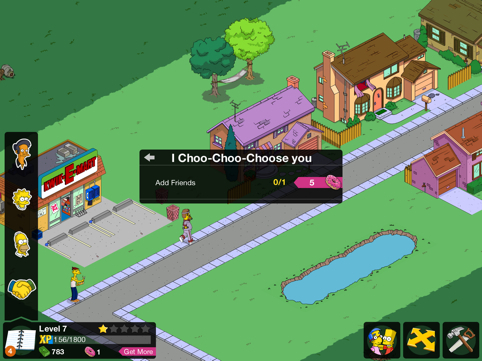 Each character in The Simpsons: Tapped Out comes with a unique set of goals to complete, and you're free to send them on these missions whenever they are available. Why bother doing this? Because you stand to earn Money and XP. 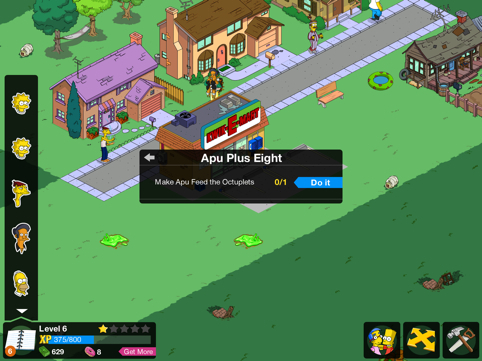 The list of missions includes telling Apu to feed the octuplets, having Cletus brew moonshine and watching Ned Flanders go for a power walk. Just keep in mind that missions range from just a few seconds to complete, to several hours. Of course, you can always finish them instantly with Donuts. Indolence: Buy houses for families to fight and sleep in. Consumerism: Buy stores to get suckers to drop dough. Tree-hugging: Buy plants to make your town greener. Vanity: Buy decorations to beautify your town. Obedience: Buy public buildings to keep society docile. Gluttony: Buy restaurants for people too lazy to cook. Righteousness: Keep criminals and graffiti off the streets. Socialism: Make friends and visit them. You can always check how much Money and Donuts you have, current level, points needed to level up and number of available missions via the bottom left corner of the screen. You can even buy more Donuts from there, under the pink arrow that says, "Get More." You can grow a variety of plants on Cletus' Farm that'll bring in more Money and XP. Well, except weeds. Those things are useless. 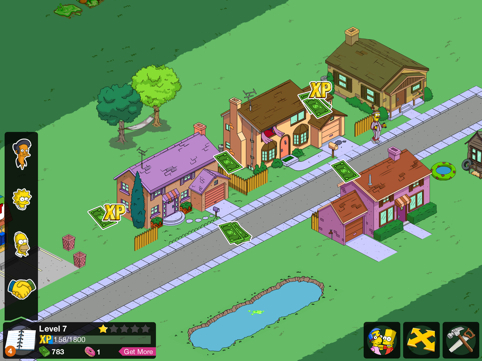 Each day, you can visit a friend's Springfield and tap up to three buildings to collect rewards. You will need to sign-up for/log into a free Origin account, and EA will give you 2 free Donuts for doing this. Don't like where you put something? Move and/or rotate it by clicking the four directional arrows on the lower right. From there, tap the desired (or undesired) object. From there, you can change its direction, move it someplace else, store it in your inventory for future use and even sell it for Money. After purchasing land, have Homer or Lisa clean up all the debris and toxic sludge, as this will net some Money and let you build on that location. You can't build or move something onto garbage. You don't need to spend money to build roads, pavement and rivers, so always seek to rapidly expand. As we previously mentioned, signing into Origin will score 2 free donuts, and you'll receive 5 free donuts for inviting friends. Spend Donuts to make more Money. That's the Springfield way. These special items imbue the town with lucrative bonuses. 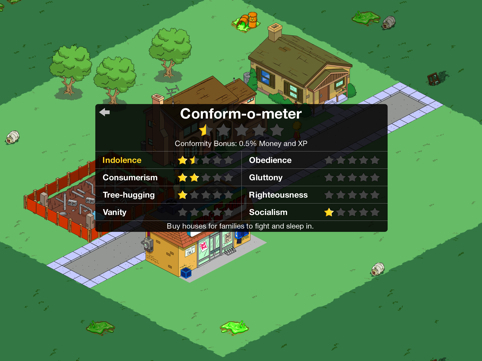 To see the current list, click the build icon on the lower right (the saw and hammer), then click the Homer Buddha. Here's a small sampling of the stuff you can buy. -Orange Tree (15 Donuts): 0.50 percent bonus money and all XP to all Jobs. -Squeaky Voice Teen (30 Donuts): This character's jobs earn 50 percent more money and XP. -Lard Land Donuts (110 Donuts): Earns 125 Money and 13 XP every four hours. -Duffy Brewery (190 Donuts): Earns 200 Money and 20 XP every six hours. -Mystery Box (6 Donuts): Win Lard Lad Donuts, Tire Fire, Squeaky Voice Teen or Donuts! 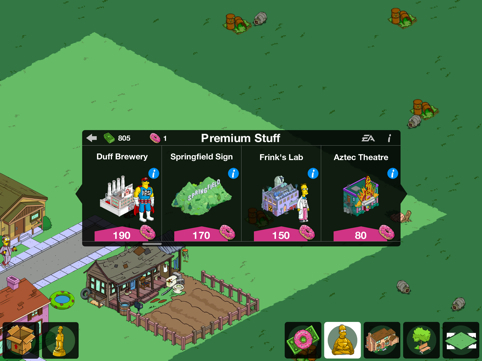 The Simpsons: Tapped Out- What Makes It So Good?